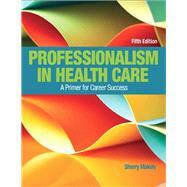 Professionalism in Health Care: A Primer for Career Success is a full-color, engaging, conversational text that helps students understand the common professional standards that all health care workers need to provide excellent care and service. It brings together complete coverage of these and other crucial soft skills: work ethic, character, relationships, teamwork, communication and etiquette, honesty, cultural competence, personal image, and personal health and wellness. Revised and improved throughout, this edition gives students a clear understanding of where they fit in the changing health care system, why patient satisfaction is more important than ever, how to behave with the professionalism that both employers and patients demand, and how to move forward in their own careers. MyHealthProfessionsLab is an online homework, tutorial, and assessment program designed to work with this text to engage students and improve results. Interactive activities allow for students to become self-aware, role play, and prepare for future interviews and on-the-job interactions. Within its structured environment, students gain knowledge that will carry through to their professional careers. Note: You are purchasing a standalone product; MyHealthProfessionsLab does not come packaged with this content. Students, if interested in purchasing this title with MyHealthProfessionsLab, ask your instructor for the correct package ISBN and Course ID. Instructors, contact your Pearson representative for more information. Dr. Makely created and managed health sciences educational programs and workforce development initiatives in hospitals and universities for more than 42 years. She has a bachelor’s degree in Radiologic Technology, a master’s degree in Education, and a doctorate degree in Human Resources. Dr. Makely served as Director of Education for the School of Radiologic Science, and Manager of the Employee Education and Development Department for Methodist Hospital, Clarian Health, and Indiana University Health for 38 years. She has authored textbooks on professionalism for health care workers for more than 15 years for Pearson Education. With more than 20 years experience as a Medical Assistant, Clinical Education Coordinator, and Program Director, Ms. Austin serves as Medical Assistant Instructor for Ross Medical Education in Cincinnati, Ohio. With a bachelor’s degree in Health Care Management and a master’s degree in Higher Education, she served as President of the Indiana State Society of American Medical Technologists and gives presentations on Professionalism in Health Care for state and national medical assisting conferences. Dr. Quay Kester, President of Evoke Communications, specializes in diversity and inclusion initiatives to build cultural competence and confidence in health care, academic, and corporate organizations. Her avid commitment to learning about cultures and customs has taken her around the world and within various economies. Her national and international experience makes her a sought after speaker, leader, and facilitator. Dr. Kester has served as adjunct faculty at Indiana University, DePauw University, and as Visiting Professor at the University of Cape Coast, Ghana. With a doctorate degree from Indiana University, she is a Master Practitioner of Neurolinguistic Programming and a Certified Medical Illustrator. She serves on numerous boards including the Diversity Roundtable of Central Indiana.